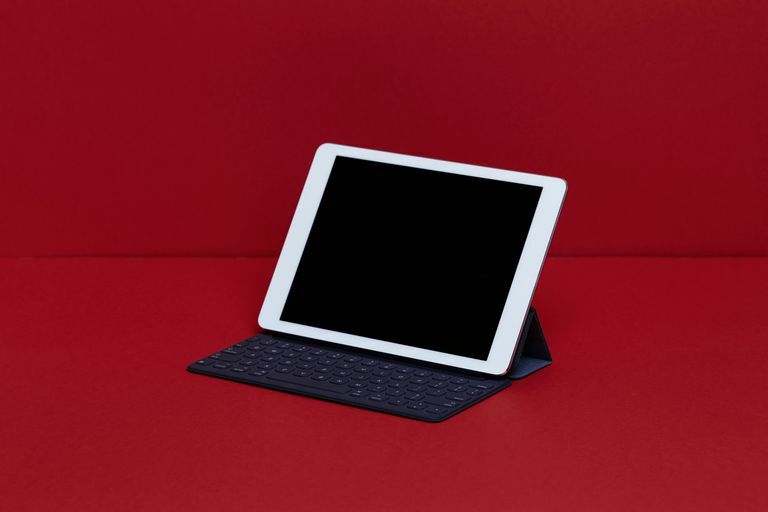 The iPad does a great job with text input — especially the 12.9-inch iPad Pro, which has an on-screen keyboard roughly the same size as a real keyboard and includes a row of numbers at the top. Even the smaller 10.5-inch iPad Pro and 9.7-inch iPad have enough real estate on the screen to make typing reasonably comfortable. You can also use an alternative keyboard instead of the default on-screen keyboard. The iPad supports widgets, which are apps that essentially run inside of another app, such as a photo filter that can be launched within the Photos app. Widgets extend to keyboards. If you prefer Swype or similar keyboards that allow you to glide your finger through words instead of tapping them out, you can install this type of keyboard as a widget. And while Siri gets a lot of press for answering questions or being a personal assistant, she's actually quite good at taking voice dictation. The standard on-screen keyboard has a microphone key on it. Anytime the keyboard is on the screen, you can tap this microphone key and dictate to your iPad. You can also hook up a wired keyboard, which means you can use your desktop PCs keyboard in a pinch. However, to do this you'll need the Camera Connection Kit, which essentially turns the Lightning adapter into a USB port. The on-screen keyboard may even be better than a wired keyboard at some tasks. A few features of the iPad lend the on-screen keyboard a helping hand. The virtual touchpad. This is one of the iPad's coolest features once you learn about it. Touchscreen devices generally allow you to move the cursor to a certain point of text by touching that area with your finger or holding your finger down to guide the cursor. This replicates what we do with the mouse, but oftentimes, it is not quite precise enough to allow us to quickly place the cursor where we want or to select a large area of text. The virtual touchpad eliminates this problem by turning the on-screen keyboard into a touchpad when you touch the screen with two fingers. As you move your fingers around the touch screen, the cursor will move with them, allowing more precise control over it. Spelling and word suggestions. While auto-correct works with a keyboard, the feature often wastes more time than it saves when you're inputting a large amount of content. When you turn off the auto-correct feature, the iPad will still highlight words it believes are misspelled, but instead of auto-correcting, it will give you the choice of which word to use. You can also use the suggested words on the screen to speed up your content entry by typing the first part of a word and then tapping the suggestion to complete it. If you've used the iPad enough to know that you want a good, solid physical keyboard, you have plenty of options. The first decision you'll need to make is whether to go with a standard wireless keyboard or to opt for the keyboard-case combo. While a keyboard case will essentially turn your iPad into a laptop, they do have an advantage. If you are going to do some work on a train or a bus or some other locations where you will be using your lap as your desk, nothing beats the feel of a laptop for keeping both the keyboard and the display steady. But getting the iPad into and out of that keyboard case all the time can be frustrating, and keeping it wrapped in that case all the time does seem to defeat the purpose of having a tablet. So opting for the keyboard case may depend on just how much time you want to spend with the keyboard. If you almost always want a keyboard connected, the keyboard case is perfect. And if you only want it connected on specific occasions such as while traveling, the keyboard case can be a good choice. But if you fall into that in-between of needing a keyboard sometimes but wanting a tablet most of the time, you'll want to go with a wireless keyboard. The iPad works with most of the best Bluetooth keyboards on the market, so you don't need to buy a special keyboard built specifically for it with a price hiked up to match. The new Smart Keyboard is a good option despite being rather expensive for a keyboard, but it will only work with the new iPad Pro tablets. When you're looking at keyboard options, also think about what you will be doing with the iPad itself when using the keyboard. You may want to buy a stand for the iPad if your case doesn't support propping the iPad up in some way.